Griffin wants to have a baby. Problem is, he doesn’t even have a girlfriend. He would adopt, but that raises another problem: his criminal record. Well, not strictly a criminal record, but he did a good stretch of time. 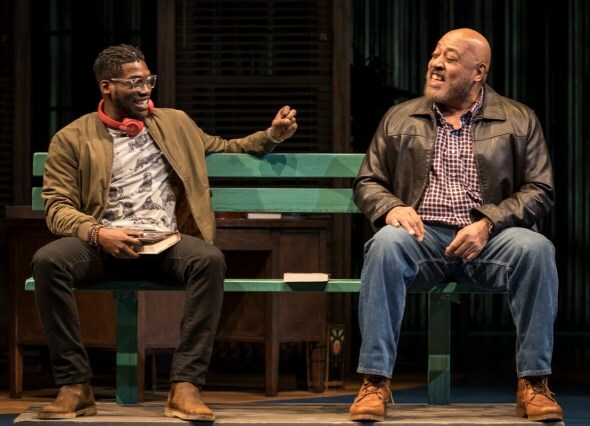 Griffin’s conundrum is the core, the tease, the red herring of Christina Anderson’s delightful and touching new play “How to Catch Creation,” now in its world premiere run at Goodman Theatre. For the moment, the relationship is all smiles between Riley (Maya Vinice Prentiss) and Stokes (Bernard Gilbert). I might have said lust was at the center of Anderson’s play. Not merely the sexual drive, but more broadly the profound, basic human urge to create – to project something of one’s soul and essence upon the world, to leave a mark, a print. Griffin is but one of sundry characters in “How to Catch Creation” who grapple with this life-defining need. Most of them are artists of one sort or another, and mostly they are women. They fall into various pairs, or more accurately changeable pairings, all of whom interact – and not only in the present, but also over a span of half a century. It’s complicated, a web of moving intricacies symbolized by designer Todd Rosenthal’s cleverly synchronized double rotating set, the two components turning opposite each other. The play itself is like that: whirling yet snugly laced, its constant turns fraught with surprises. Griffin (the open-hearted and endearing Keith Randolph Smith) shares with lesbian pal Tami his carefully thought-through goal of fatherhood. Tami, portrayed by Karen Aldridge with a well-textured blend of confidence and vulnerability, manages sympathy even as she questions Griffin’s grip on reality. A college administrator and erstwhile painter, she sees her own creativity rekindled by a young woman who bursts into her office to advocate for her boyfriend, a painter whose application to the school has been rejected. In a chance meeting, Stokes (Bernard Gilbert) and Griffin (Keith Randolph Smith) discover they read the same books. The aggressive young woman is Riley, her frustrated boyfriend Stokes. 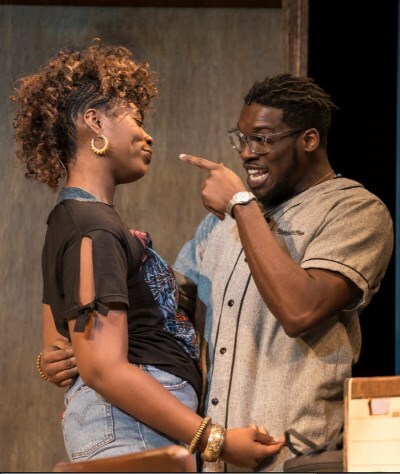 Maya Vinice Prentiss and Bernard Gilbert show us a real-world couple about to be tested by the options life can suddenly throw in front of us. Their heated mutual attraction, in other words, is tempered by conflict, self-discovery, drift. Like Griffin, the fiftyish aspiring father with no real mate, young Stokes is an avid reader; indeed, they share an enthusiasm for a mid-20th-century novelist called G.K. Marche – a commonality that turns a chance meeting on a park bench into genuine friendship. At the same time, Griffin’s lesbian friend Tami and Stokes’ girlfriend are also hitting it off, if that turn of phrase really says it. The contemporary story of “How to Catch Creation” begins half a century ago with a novelist (Jasmine Bracey, right) and her lover (Ayanna Bria Bakari). Time now to wind the clock back 50 years to the heyday of the aforementioned novelist G.K. Marche, whom we meet in the high-intensity persona of Jasmine Bracey. 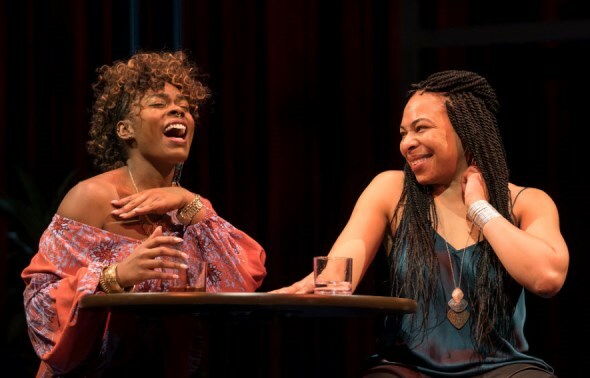 She’s a lesbian in an on-again-off-again relationship with Natalie (Ayanna Bria Bakari), who is not an artist but who, willy-nilly, finds her own path to creation. As the play progresses, we swing back and forth between the drama of the present and the seeds of revelation sewn in that earlier time. Anyone paying attention can see how this is all going to resolve itself, one way or another, from a mile away. Babies happen. That’s all I’m saying. You can infer the rest – albeit at some risk of being flat wrong. A lot of very funny stuff, mixed with incursions of heart-tugging pathos, move us along from scene to scene with ever greater certainty about the sweet denouement to come. The brilliance of “How to Catch Creation,” tightly written and witty and authentic, prevails to the end. 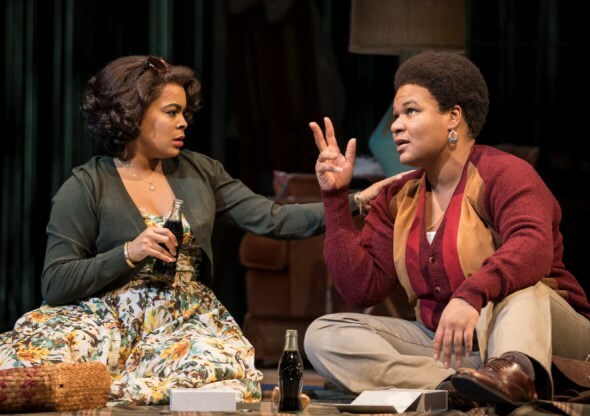 It’s a polished show, directed by Niegel Smith with grace and empathy as well as taut line and a keen ear for its the play’s tone. But check your assumptions at the door; wherever you think this sly scramble is going, trust me, it’s not headed there.